In the early 1990s, Procter & Gamble let the trademark on its White Cloud toilet paper lapse as it focused attention on its more expensive Charmin brand. Sensing opportunity, Wal-Mart quickly stepped in and resurrected the brand for its exclusive toilet paper line. Flash forward a decade or so and the Wal-Mart version continues to rate highly in consumer rankings, yet there's a fair amount of confusion surrounding the White Cloud name. There is White Cloud Electronic Cigarettes, WhiteCloud Analytics, White Cloud (private air) Charter and even Casino White Cloud. Similarly, the proliferation of cloud-based services in the technology world has certainly created a cloud of confusion for banks. Broadly, cloud computing lets people use the Internet to tap into hardware, software and a range of related services on demand from powerful computers typically housed in remote locations. The benefits are multiple. Among other things, cloud computing can reduce cost, improve flexibility and scalability, increase efficiency and allow banks to serve customers faster. After balking at the idea of cloud computing for many years, a number of banks are starting to explore the options further, particularly as it becomes more universally acceptable and as cloud-based systems proliferate. A recent study by the Cloud Security Alliance found that security professionals receive, on average, 10.6 requests each month for new cloud services; and 71% of companies now have a formal process for users to request new cloud services. Common misconceptions, however, remain a hurdle to broader adoption. One common misperception is the belief that the data stored in the cloud is not secure. This may stem from a fundamental misunderstanding of the differences between the private and public clouds. Public clouds allow users to access resources, such as applications and storage space, publicly over the Internet. Two popular examples of public clouds in action are Dropbox and Google Drive. By contrast, private cloud solutions service a single company and are managed in-house by an IT department. 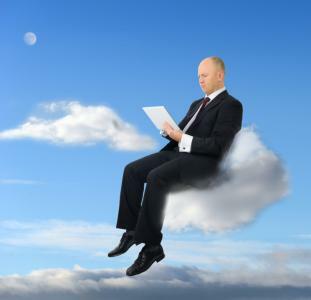 For banks exploring cloud computing, private cloud solutions are a regulatory necessity. Private clouds have their challenges, but with due diligence, banks can find solutions that offer a high level of security and privacy. Indeed, large cloud providers often have more resources to monitor for breaches and handle issues that crop up than banks with smaller IT departments. Certainly they have numerous financial and reputational incentives to provide top-notch security. As you're mulling this over, consider that data breaches often start within an organization and that the cloud itself isn't something to be feared--nor is it really a cloud. Many banks wrongly assume they can do nothing to help protect their data security in the cloud. Rather, banks can help to mitigate security risks by encrypting data, using secure networks and managing passwords properly. You can also make informed choices about what information gets stored in the cloud vs. what stays in-house. Certainly, not all cloud applications are created equal, so do careful research before jumping in. Secure cloud applications should require multifactor authentication instead of just a username and password. They should also limit access only to certain personnel and employ strong data distribution controls. Being able to separate the facts from fiction is critical to developing a cloud-based strategy before you go floating around in it. As you ponder whether cloud-based systems are right for your bank, try not to let misconceptions cloud your judgment. Treasuries reversed yesterday's gains, raising yields 3bp, as oil prices stabilized by the close of the markets. A survey by Consumer Reports finds 77% of respondents said they were highly satisfied with the service provided by smaller traditional banks that are more community based and tend to focus more on customer relationships. A survey of students globally who are inclined to become bankers by Universum Talent and Deloitte finds top aspirations of this group are: professional training and development (53%), high future earnings (51%), leaders who will support development (48%), financial strength (46%) and a good reference for a future career (46%). The Financial Times reports the world's top investment banks earned an ROE of 6.7% in 2015 vs. 9.2% in 2014. Both are well below their 10% cost of capital, so look for more job cuts to continue in this sector. Barron's projects GDP will grow 3.0% this year, boosted by continuing declines in the unemployment rate, the lowest unemployment insurance claims in decades, rising wages and salaries, increased consumer spending and strong bank lending with low defaults outside of energy. Fingers crossed! Cleveland Fed President Mester said the economy remains strong despite recent volatility and that the FOMC will continue to raise rates at a "gradual" pace. The IRS has released 2015 data that shows: it audited 25% more tax returns with income of 1mm or more YOY (about 10.0% vs. 7.5% in 2014); it audited less than 1% of individual tax returns (lowest level in 10Ys); it collected 5.2% less in revenue YOY ($54.2B vs. $57.2B); it had 7% fewer officers and agents YOY (17,208 in 2015); it examined 8% more business tax returns (61,677 vs. 57,211) and it increased exams of S corporations by 14%, while partnerships soared 21% YOY. Thomson Reuters reports worldwide M&A activity is down 23% this year vs. last year, due to investor concerns over falling oil prices, softening growth in China and the risk of a potential spillover to the financial sector. Research by comScore finds smartphone users visit or use an average of 25 apps per month, but spend 80% of their time using their top 3 favorite apps.